Mama bunny and her litter were all adorable, of course, with their pointy ears and gangly back legs all jostling for room in the too-small glass tank. There were black ones and white ones and one single brown one. The pet store owner, spotting a sucker, decided I must hold one. I pointed to brownie, and the pet store owner put him in my arms. Andy and I knew nothing about rabbits, but we followed all the shopkeeper’s advice and purchased the wrong cage, the wrong food (we researched later) and my husband chose a white litter-mate, another male, as brownie’s companion. I still remember that first night, how my husband and I stared at the little rabbits and they stared back at us from their cage. We named the brown bunny Pumpkin and the white one Lemon. They’d munch a strand of hay, not taking their eyes off us, ears up. I thought they looked expectant, but not afraid. I felt discomforted by the knowledge that we had just purchased two little lives with which we could do most anything we pleased. Luckily for them, we had honorable intentions, because the store owner didn’t ask. We let them out of their cage and enjoyed the novelty of watching rabbits exploring our Manhattan studio apartment; these creatures who looked like they belonged in a forest or meadow somewhere. Back then, I was using my writing degree to work for a literary agency. My job was acquiring foreign distribution rights to offer to agents and publishers in foreign countries. I wrote creatively on the side–short stories and poetry mostly. I– you know–vaguely cared about animals and the environment. I liked whales and polar bears and elephants; I had been vegetarian for years. I was also, in many ways, profoundly unhappy. New York City, which years ago had seemed so exciting and promising, felt like a wasteland as I matured: not enough green, not enough room, dirty air, polluted rivers. I took antidepressants to cope with a life that often seemed empty. My love for those first two rabbits was like a gateway to an appreciation of animals and nature. In New York, I began volunteering with Rabbit Rescue and Rehab and in the “exotics” room of the Harlem SPCA. Seeing those rabbits, rodents, ferrets, and birds living in crowded city shelters, I started longing for a very different landscape for them–and for myself. Soon after our wedding, my husband and I packed up the rabbits (which by then numbered three. We had also acquired a few rodents.) We moved from the Big Apple to the Florida Keys. My experience volunteering with “exotics” landed me my first job with wildlife: cleaning cages at the Wildlife Rescue of the Florida Keys. I never would have applied for that job had that shopkeeper not put a little brown bunny in my arms. Jump forward ten years, and be astounded by the fact that I kicked the Prozac through helping animals. I would like to thank all the amazing animals that it has been my honor to know personally and professionally: At the aquarium, there was Hector the hawksbill sea turtle who loved his shell scratched and shook with glee like a golden retriever if you used a pool brush. At the wild bird rehabilitation center, there was Hermes, the peregrine falcon who I rescued from a mangrove tree where he waited to die after breaking his wing and falling to the sea. There is still Bonnie the broadwing hawk who flies to my arm every day for her dinner. Some days, I still miss Mayhem the homeless prairie dog for whom I finally found a home and a mate. I think about the oddball critters I have made deep connections with through the years–a ground squirrel, a tortoise, a grouper, an octopus–and I smile. I have been privileged to hand-feed nurse sharks in front of awestruck crowds. Once, I jumped into shallow water to hold up a wild bottlenose dolphin who was trying to beach himself. He and I spent hours, skin on skin, eye to eye before the trucks came with the equipment to try to keep him alive. While working for the butterfly conservatory, I held butterfly pupae in my hand, felt them twitch, had seen them open, and watched the emergence of the butterfly who hangs its wings to dry for hours, patient, though it has but days left to live. Of course, there have been other rabbits–lots of rabbits: Wilbur and Bolter and Iggy and Bean and Sweetpea. There were shelter rabbits, rescue rabbits and feral rabbits. I was once involved in a failed rabbit rescue group in the Lower Keys. My writing changed too; more nonfiction began to emerge. I suddenly wanted to share my knowledge of the creatures with which we share the Earth–it really is amazing, the diversity on this planet. If only we appreciated it more and took better care of it. After getting to know rabbits, I became more politically active, more of an advocate for animals and conservation of wildlife and the environment. Now, our original two rabbits, Pumpkin and Lemon, are nearly eleven years old and in their golden years. We have four rabbits altogether, and a rat and a cat as well. My little brown bunny is arthritic and has kidney troubles. I am not sure how much longer we have. I repay him for changing my life as best as I can, taking him out in the yard to enjoy the sunshine and fresh grass, giving him good things to eat, petting him maybe a little more than the other animals. I put the heater next to his cage when it’s cold and I say nothing when he pees under the bed. How else can I thank him? I opened myself up to love a little brown rabbit, and the rest of the planet came tumbling in. Sarah Goodwin-Nguyen is the author of a travel guide called Key West: a Guide to Florida’s Southernmost City (Parkscape Press) as well as ebook on rabbit care titled The Pet Rabbit: From Head to Feet and Everything in Between. 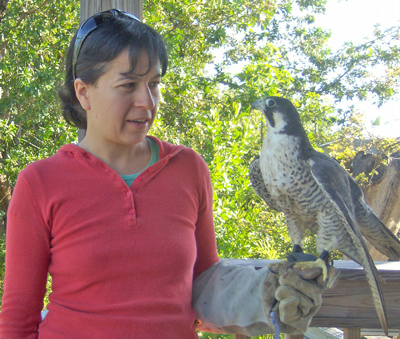 When not blogging, writing poetry, or working on her novel, she can be found at the Key West Wildlife Center. What a beautiful story, extremely well-written also. Thank you for sharing.